The Federation needs you for an urgent do-or-die mission in `Starship Troopers`, the ultimate sci-fi action thriller from the director of Total Recall... hailed for its mind-blowing special effects and amazing futuristic settings! The new millennium brings man face to face with the deadliest enemy of all... an intelligent race of alien bugs, some thirty feet tall, some that fly and all capable of destroying every living thing on Earth! That`s where brave young freedom fighter Johnny Rico comes in. While Johnny trains in an elite infantry unit, his stunning girlfriend Carmen becomes a top fighter pilot - but is seduced by a suave flight instructor! Join their mission to the aliens` home planet where an all-out intergalactic war is about to begin and with the future of mankind on the line. Epic filmmaking and jarring action sequences that put you in the middle of it all make `Starship Troopers` the definitive space-age adventure thriller in this or any universe! Two years after Buena Vista released a flipper version of the film with no extras, they have now given Starship Troopers the treatment it deserves. The picture and sound quality are perfect. The main thing about this re-issue is the extras. First, we have a 2 minute trailer. Then, a 8 minute featurette which is fairly interesting. which focus on the destruction of the starship, the bugs and a test which was shown to Hollywood studios. 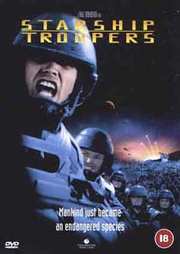 There is also screen tests featuring Casper Van Dien and Denise Richards. Finally. there is a trailer for Pearl Harbour. All in all, Disney should be congratulated on finally realising how to put together a DVD. This is only the beginning though. According to the BBFC, there is some promising extra material for Disney films such as The Emperor`s New Groove, Dumbo and Pochantas. They are also re-issuing all of their remaining flipper titles with extras. So things are looking good for the House Of Mouse. If you have not bought Starship Troopers due to it being a flipper, get this version now. It contains everything from the R1 version so you are not missing anything. This is a great new version, but not worth buying if you have the original, even if it is a flipper. screen tests ect.This is the kind of treatment it deserves and it is about time! What would you do if, the only way to become a citizen of earth were to enlist in military service? Now before you answer, remember that we have discovered that there is a planet of bugs that is attempting to colonize the earth by hurling asteroids towards us that have their spores on them. If you are the type of person that doesn`t have a problem with leaving your brain at the door prior to going to a movie, or if you prefer action and splatting to plot and character development then this may be a movie you would enjoy. Don`t take that the wrong way, this is not to say that the movie is not good for what it is (a sci-fi, shoot em up thriller), just don`t expect any best actor or best picture awards for this one. There was one question that remained in my mind from the start of this movie and still remains now, "why not just nuke the whole planet?" but I guess that would have made for a much shorter movie. I guess it`s up to the individual viewer to decide if this new edition is worth buying for those who already own the original, but if you`re a big fan (if you are a big fan then why not invest in the region 1 Spec Edition? ), I`d probably say yes. The one thing that especially impressed me was the informed materials and commentaries that did not shy away from discussing the political aspects of the story, while still maintaining a professional examination of the film on a technical level. this movie is`nt and should not be treated as a simple vaccuous hollywood blockbuster in the same vein as all the other crap around today. it is a very acute commentary on communist ideology using a superb mixture of propoganda parodys in highlighting why anything foreign and alien must be destroyed rather than understood. it has the subtle and exceptionally dark humour that was so prevalent in the outstanding Robocop but was sadly lost on most people who saw this movie as a b-movie shoot-em-up. leave any preconceptions at the door when watching this fantastically underated gem of a film and you`ll love it. A brilliant cult sci fi movie that is destined to be a classic. The characters are very well developed. Casper Van Dien hasnt made many good movies, he`s a bit of a B-movie actor but he plays his role with some style. Denise Richards was fairly unknown before she made this movie but after finding fame with this movie, she has quickly become a household name. The visuals are very cool. There is alot of impressive CGI used in this movie but you can hardly tell. The picture quality is brilliant. The sound also is fantastic. The extras also of superb quality. Bottom line, this is a fantastic dvd but there is a new region 1 special edition 2 disc set that is identical to this but has a brand new feature length documentary so I think it would be best to get that version. Paul Verhoeven`s take on the novel by Robert A Heinlen is in two ways. 1) it turned out how we expected it to, extremely violent 2) it actually turned out to be a good film. The Cast do actualy take their roles properly but play them in style. The film features some impresive CGI and effects. It`s a really enjoyable sci-fi romp! Who needs DTS when you have a Dolby Digital track like this one! The Commenatry is good and informative, the making of feature is aslo good. The deleted scenes are a good asset to this package as is the screen tests and scene breakdowns.